Adam Block Design offers the highest quality decoration types to make sure your custom design look as amazing in real life as it looks on your computer. We only use the highest quality inks, premium silk screens, and employ our years of experience to produce the highest quality, softest results possible. Once you approve your design, the real magic happens: getting it from a computer onto your tshirt! Adam Block Design can embroider on nearly any item, and offers the highest quality & best priced embroidery in the industry. Learn more about our embroidery services below. We offer 1,000s of threads to ensure your embroidered items come out perfect. We're always careful to match colors so you don't see the thread, or we can choose a color to give your design a contrast border. As you can see below, the possibilities are (nearly) endless! When we create a design to be embroidered, we're careful to select the best embroidery options for your order. We always consider the type of thread, color of stitching, and style of embroidery to ensure you get the best available result and that everyone in your group is happy. Learn more about our custom sorority embroidery! 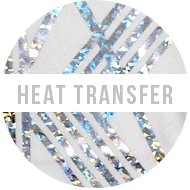 Looking for metallic foil to give your design a little extra sparkle? We offer a huge selection of foil colors ranging from solid gold foil & silver foil to black or even holographic foils! "Applique" is a shaped swatch of fabric to be embroidered onto a garment. 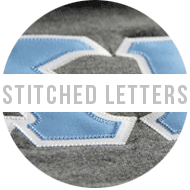 This can be used to describe custom stitched letter sweatshirts, custom pockets, or custom patches. Need matching shirts, but need even more customization? We can help you with that.